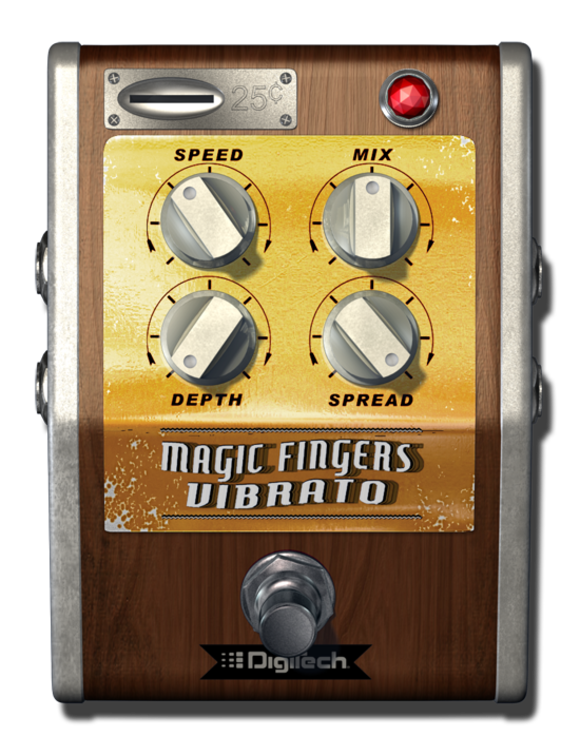 SALT LAKE CITY, Utah – Vibrato is one of the most identifiable guitar effects, and HARMAN’s DigiTech gives it a new voice with the introduction of the Magic Fingers Vibrato for its iStomp programmable pedal. Magic Fingers takes a guitar signal and modulates its pitch slightly, giving it an animated “vocal” quality. But that’s just the beginning – the e-pedal offers unique stereo panning and chorusing effects, to create new sounds unavailable anywhere else. The DigiTech iStomp is an entirely new concept in guitar stompboxes that allows musicians to turn the iStomp into any pedal in the Stomp Shop online pedal store. Offering almost limitless sonic possibilities, the iStomp connects to an Apple iOS device where musicians can use the Stomp Shop app to load it with the e-pedal of their choice. The Stomp Shop is a free app and comes with two of the most popular requested pedals, the DigiTech Total Recall Delay™ and the DigiTech Redline Overdrive™. It gives access to more than 30 additional e-pedals that musicians can browse, try out and purchase, with more e-pedals added every month.